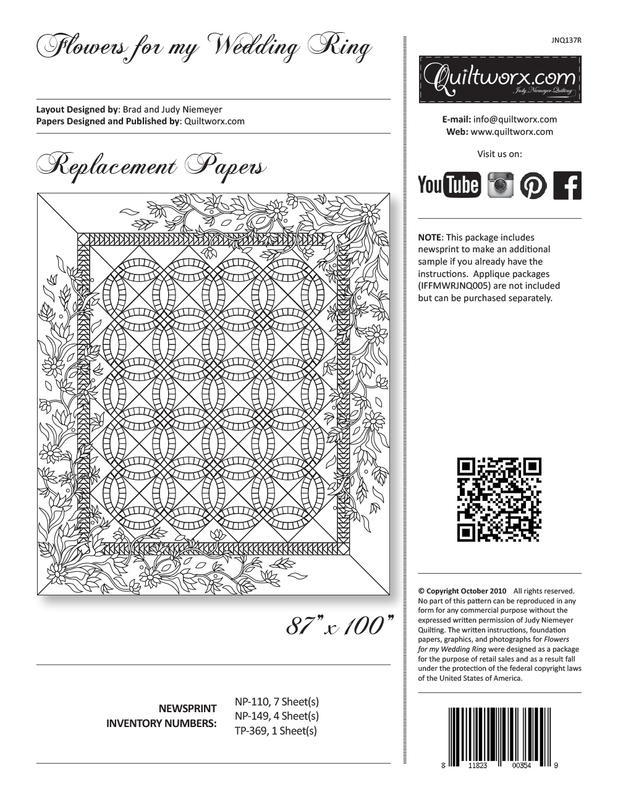 The Flowers for My Wedding Ring has been a staple of our foundation paper piecing designs since the late 1990’s. The pattern has been through various updates through the years. The most recent includes the incorporation of the Quiltworx 2-1/2″ Strip Set, addition of smart corners, reformatted instructions that incorporate hints on using the Creative Grids Templates, and updates to the applique technique. 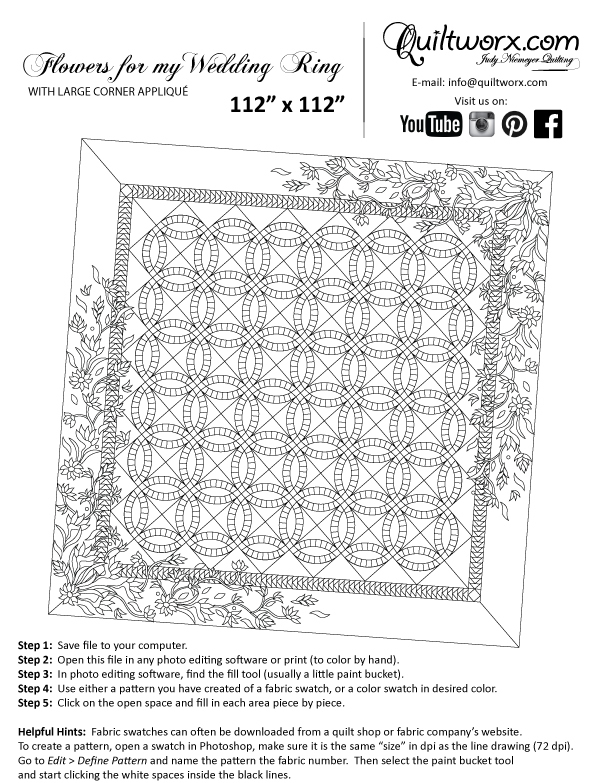 Applique for 1 corner (or 2 or more corners using layout options shown in the pattern) is provided in the pattern. 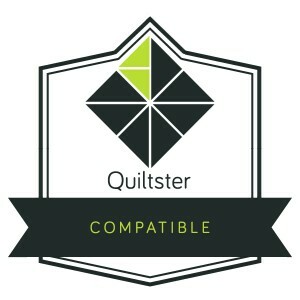 The package includes a laser-cut turn under applique stabilizer product called Stitch-N-Peel. 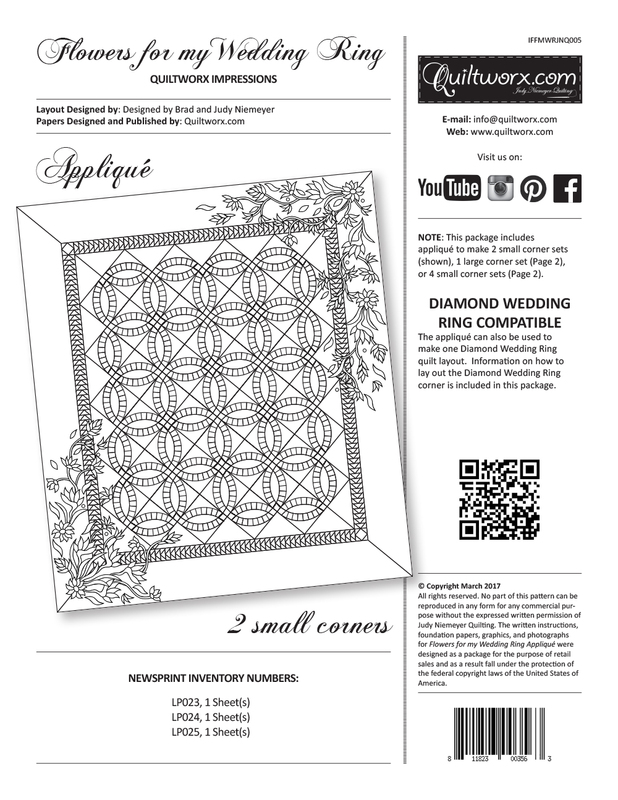 To purchase enough applique to do both corners, a second package of applique should be purchased. 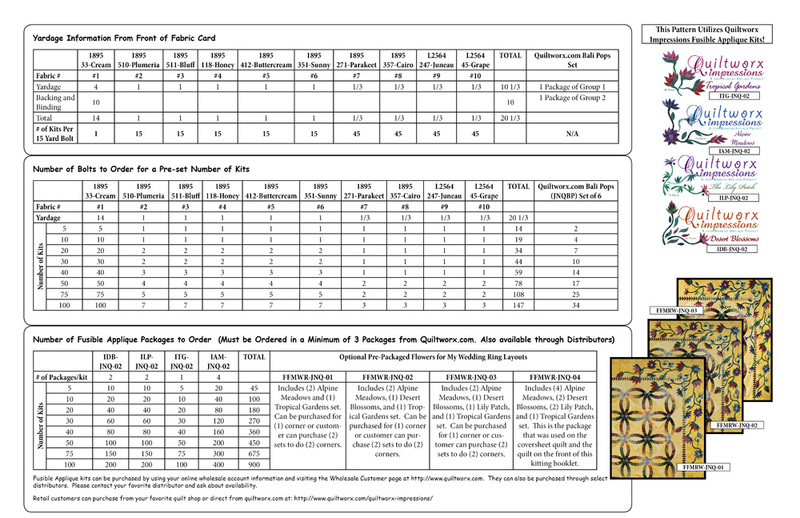 Additional applique packages are listed as related products to this pattern. 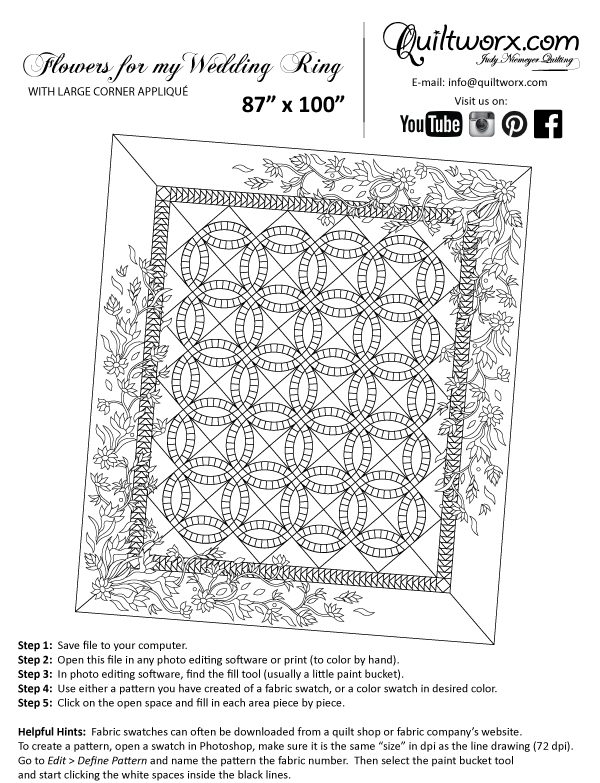 The instructions in this pattern are based on two different techniques for foundation paper piecing. 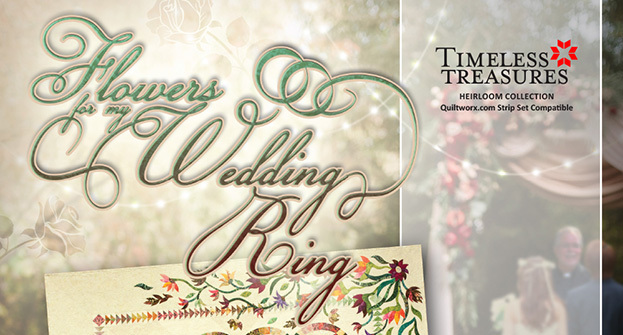 The Wedding Ring arcs are pieced using a technique called Foundation Strip Piecing. 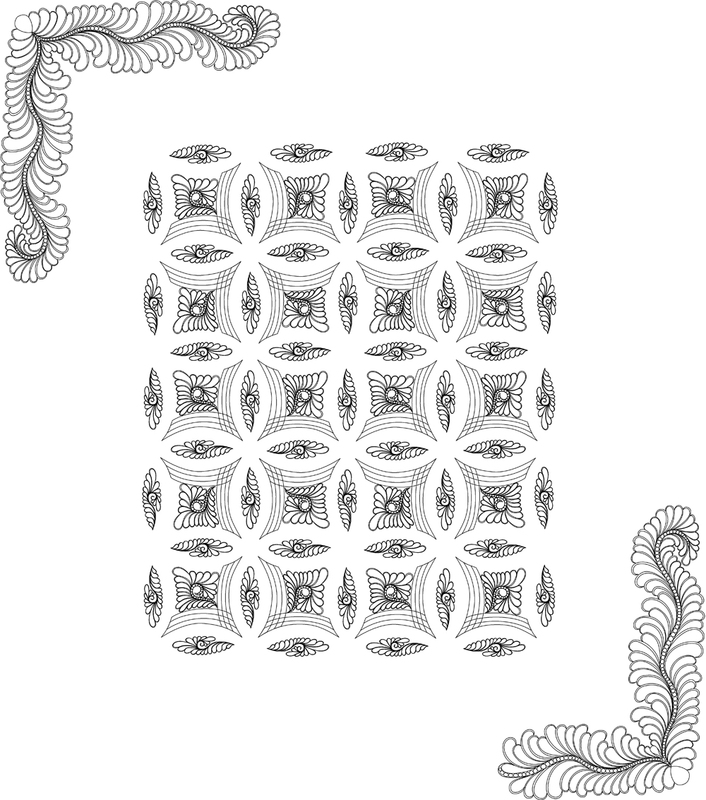 The Flying Geese are pieced using pre-cut templates pieces for the foundation paper piecing. 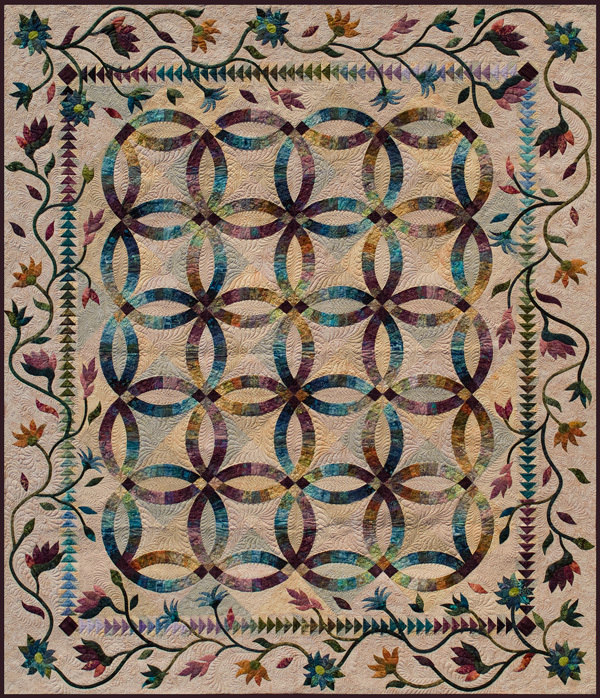 Curved piecing and traditional piecing are required to join the units after the foundation piecing is completed, and applique skills for turn under applique are necessary to complete the border flowers. 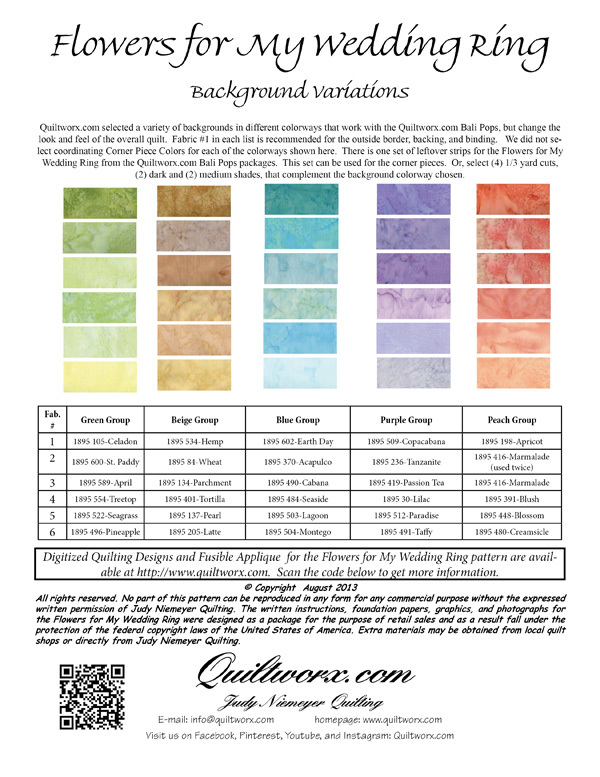 Templates for the background are included in the pattern, however a set of Templates by Creative Grids (the Createive Grids Wedding Ring Template set) is available to improve accuracy of trimming and also protect your fingers! 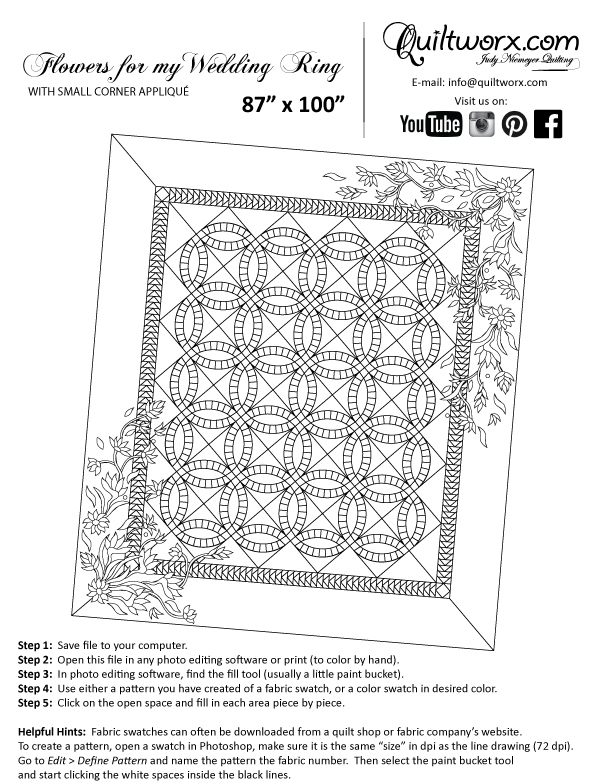 We highly recommend this template set for trimming this pattern. 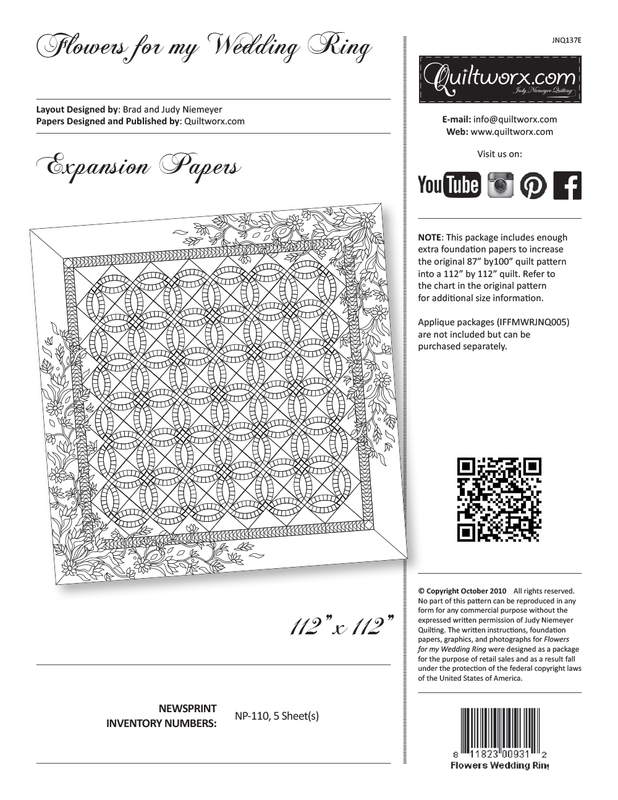 Separate paper packages can be purchased to create another sample of the pattern or expand the layout up to 112″ x 112″. 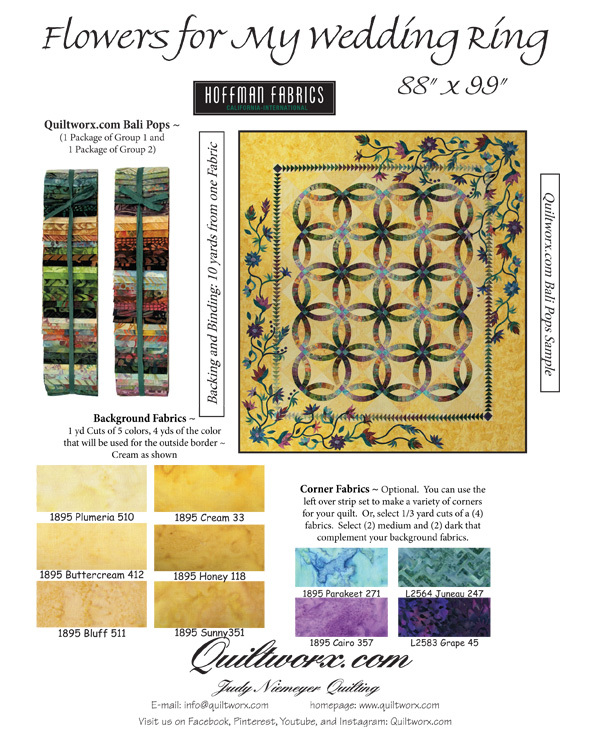 And, digitized quilting designs that fit the center of the quilt can be purchased as well. 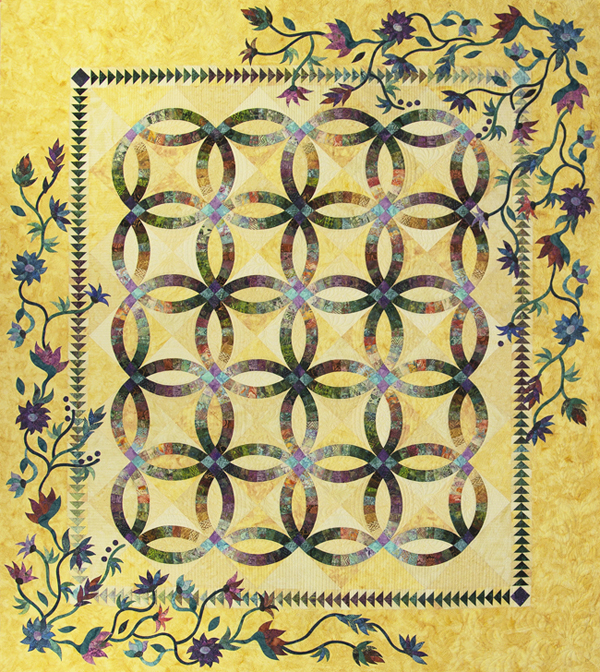 Due to the large amount of applique in the borders, some custom quilting will likely be required. 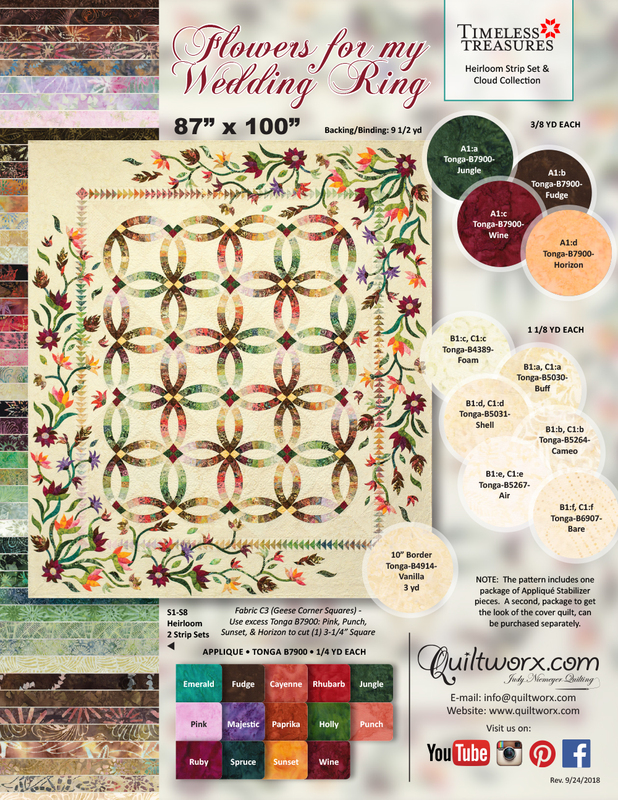 However, for smaller layouts of the applique, some border feathers are available for purchase, designed by Karen Marchetti. You should look for them! 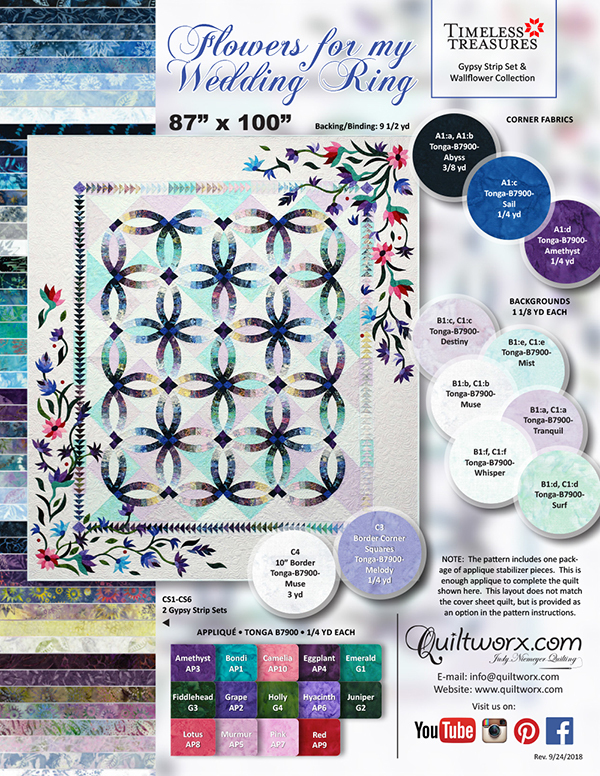 Some custom quilting will still be needed, but they fill up the space on the corners beautifully if you have enough space for them on your corners. 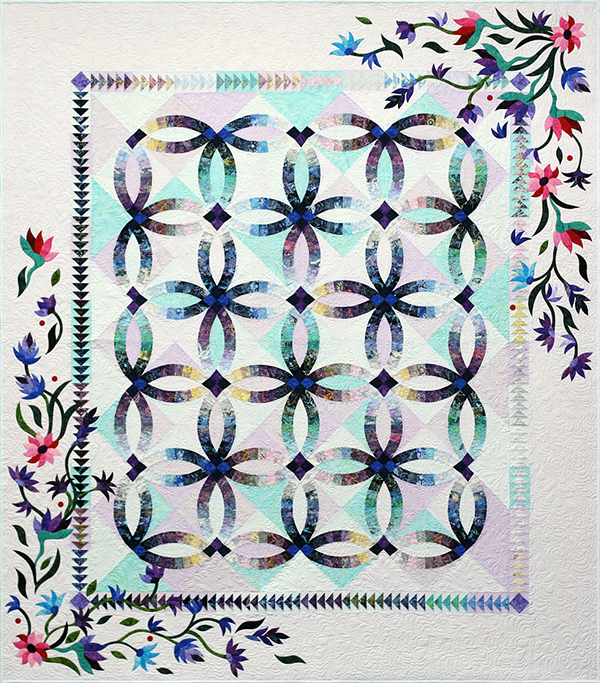 The two corner applique layout as shown on the cover is too big to use with the border feathers, but the smaller layouts presented in the pattern would work nicely with those designs. 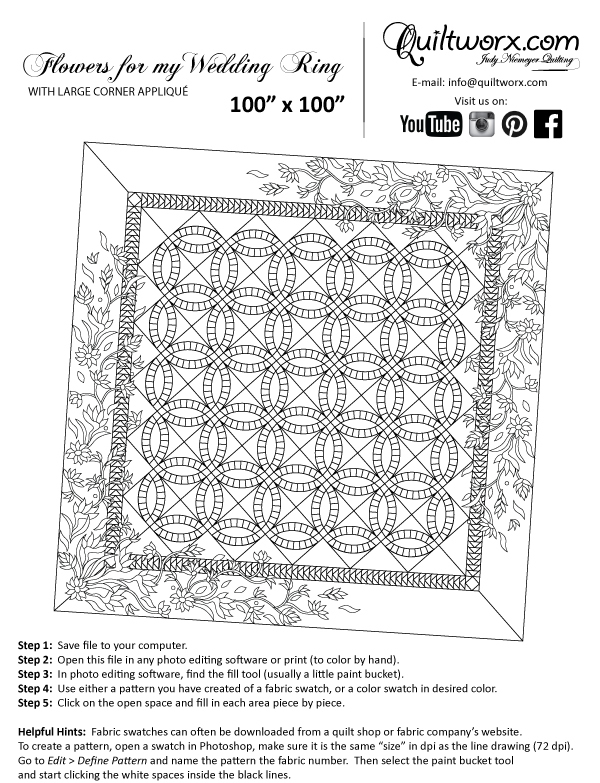 Click below for a the latest downloadable .PDF for this pattern! 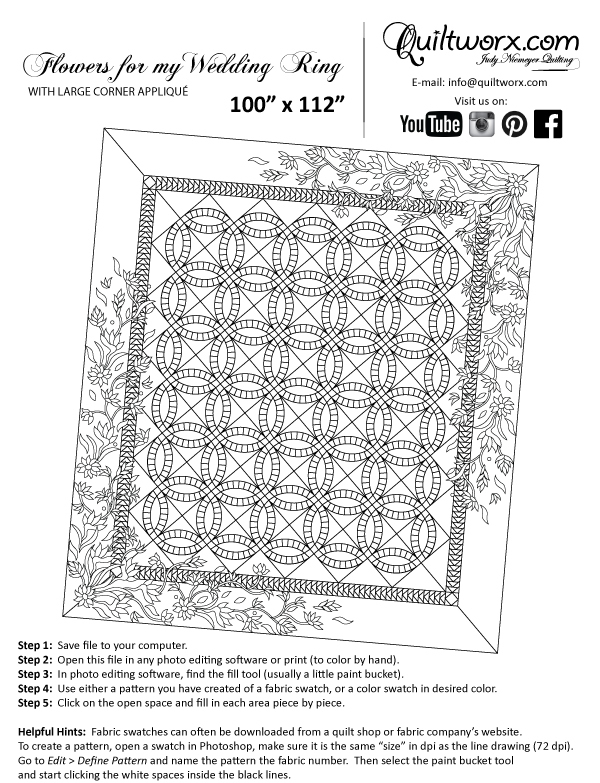 Linda Betchart Simon I love this pattern and love the colors! Bev Regimbal Jennifer Eubank, well done. Merlyn Morse love the color arrangements!!!! Flowers for my Wedding Ring, designed by Quiltworx.com, made by Alexandre Tien-Smith. Alexandre has been attending quilting camps from the age of 10, and started this quilt at a Quiltworx retreat in July 2017 at the age of 17. She quilted it herself at Always Quilting and we’re all so excited that she won Best of Show in the Youth Division at the 2018 San Mateo County Fair! Well done! Sandra Kenney Waite That's very beautiful. Love the colors !! Adele Giles I am working on mine now will take time but I’m enjoying it. Flowers for my Wedding Ring designed by Quiltworx.com, made by Lorna Raney. 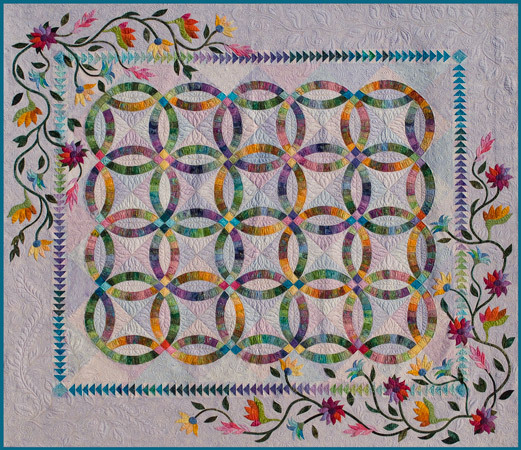 Her first Quiltworx quilt made for her grandson’s wedding, it won the Viewer’s Choice award at the Dufferin Piecemakers Quilt Guild in Orangeville, Ontario Canada! 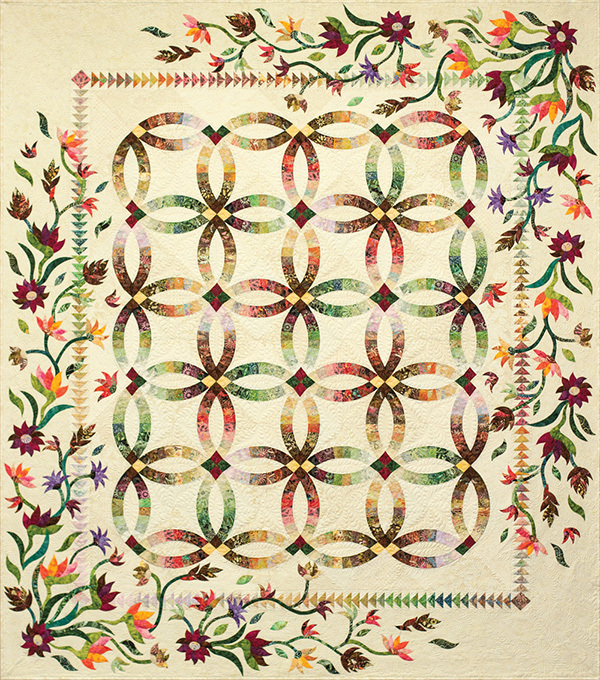 Deborah Swanson This is how mine was quilted. Jandy Hartman Arnold This is the inspiration for the one I just started! Brenda Barnett Retzlaff This is on my Bucket List.